Epic Games has announced that Fortnite Season 8’s Week 5 challenges have gone live in-game right on schedule, bringing with them yet more opportunities for players to increase their Battle Star stash. As standard, there are seven new tasks awaiting completion, with three available to all players and the remaining four exclusive to Battle Pass owners. Not one to break tradition, Epic has made sure to continue providing an eclectic mix of both combat-heavy and exploration focused challenges, some of which will no doubt prove to be a whole lot trickier than they sound. In terms of straightforward goals Battle Island visitors can get stuck in with straight from the get-go, dealing 200 damage with scoped weapons should prove easy as pie, as too, will searching chests in and around Paradise Palms and/or Shifty Shafts. Just seven of those loot caches need to be plundered, so hitting either location straight from the Battle Bus isn’t a bad shout. Moving on to the Battle Pass exclusive challenges, players will need to gain varying quantities of shield from consuming mushrooms and potions, as well as get three separate eliminations while visiting pirate camps. 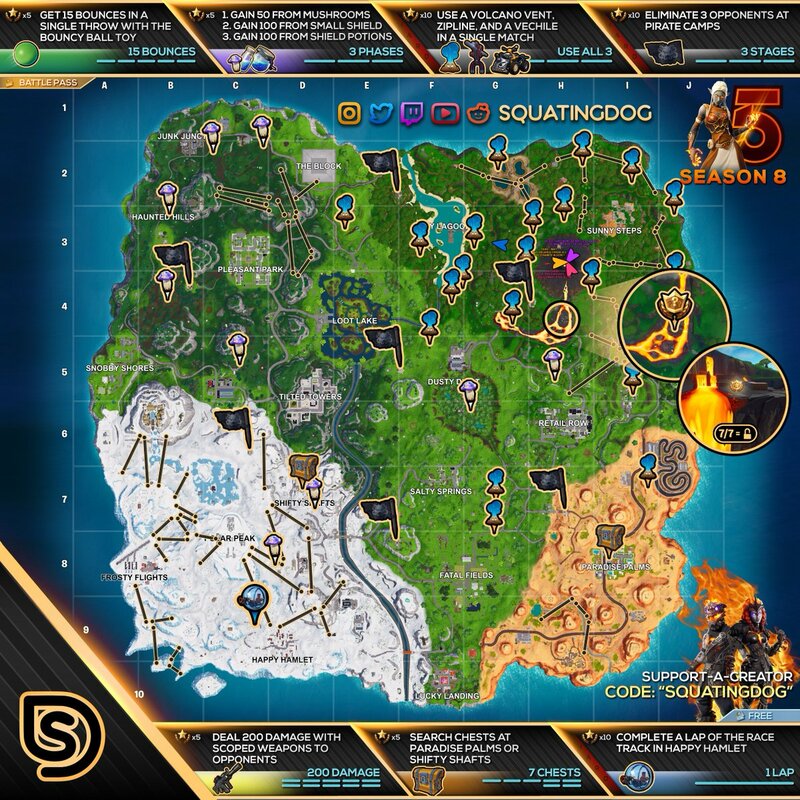 On the ball as always, Fortnite Insider has put together a handy cheat sheet revealing the best locations for completing each challenge. In case the thorough visual guide above hasn’t already given it away, the two remaining challenges sure to prove trickiest in Week 5 are to use a volcano vent, zip line and vehicle in a single match and to get 15 bounces in a single throw of the Bouncy Ball toy. These particular objectives always have the potential to prove nightmarish for the first few days as players will generally flock to the same handful of locations, but expect traffic to die down as the week progresses. If nothing else, the population migration will give Fortnite players still lagging behind a chance to catch up on last week’s challenges in relative peace and quiet.